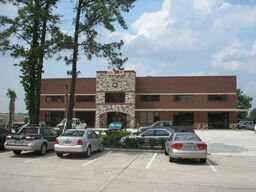 96 Beachwalk Blvd, Conroe, Texas 77304: The two-story building of 14,400 sq. ft. in Lakeview Center is located next to 14500 Highway 105 W where there is additional office space for rent. If you are interested in leasing or need more information, please contact Billy at (936) 588-7003. Status: Ground floor 196 sq’ store front office and up to 1200 sq' end cap. Second floor: 7 suites from 320 sq' to over 1200 sq' end cap. Call for office space rental availability. Please contact Billy. View: Lake Conroe Water view for some offices – What a great place to have an office! Stories: 2, Elevator in lobby and wide stairs. Location: Next to the Leasing office at 14500 Hwy 105 West Conroe, TX 77304. Contact Info: Call Billy Stevenson with Lake-Conroe-REALTORS.com, (936) 588-4444 office, Desk (936) 588-7003, Cell (936) 524-0055, email. Texas Real Estate Commission Corporate Broker License Number 0416282. Void where prohibited by law. Copyright© 1996-2019. All rights reserved. Stroman Realty is located at 14500 Hwy 105 W, Conroe TX 77304.